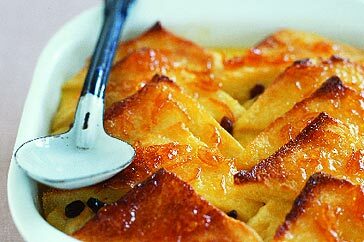 Bread And Butter Pudding has been a staple Aussie dessert for many years, having been introduced to Australia from British settlers who have been cooking it since the early 17th century. It was a way of using up stale bread, and providing a delicious tasty pudding at the same time. Soak the raisins and sultanas in the brandy or rum for about 30 minutes. Butter the slices of bread or brioche and cut each piece into 8 triangles. Arrange the bread in a 1 litre ovenproof dish. Mix the eggs with the sugar, add the milk, cream, vanilla and cinnamon and mix well. Drawin the raisins and sultanas and add any liquid to the custard. Scatter the soaked raisins and sultanas over the bread and pour the custard over the tope. Cover with plastic wrap and refrigerate for 1 hour. Preheat the oven to moderate 180 degrees celcius. Remove the pudding from the refigerator and sprinkle with the demerara sugar. Bake for 35-40 minutes, or until the custard is set and the top crunchy and golden. Note: It is very important that you use good quality bread for this recipe. Ordinary sliced white bread will tend to go a bit claggy when it soaks up the milk.